Hey folks! I’m Jay Yelas and time for this month’s fishing tip! 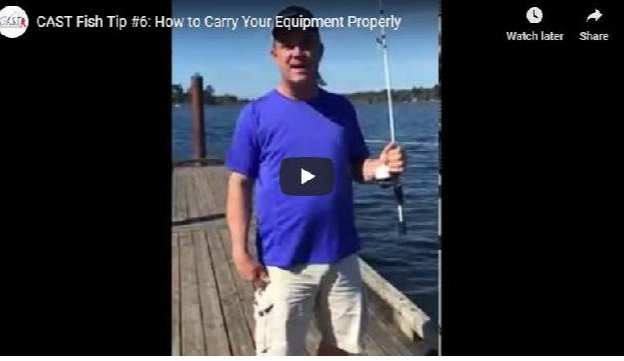 What I want to talk today about is how to carry your equipment properly. I see kids at C.A.S.T. for Kids events, they’ll get done fishing and they’ll put their rod straight out and they’ll go to move and they’ll walk and they’ll hit somebody. When you are not fishing and you’re moving to another spot, you carry the rod with your tip up to the sky that way I can turn and walk past somebody and not hit them. That’s your C.A.S.T. for Kids fishing tip for today. Come out to a C.A.S.T. for Kids event near you. Join the fun! We’re having a great year!